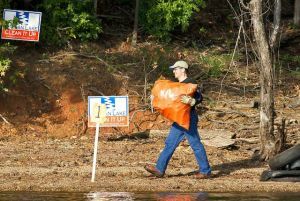 For the 6th year, Clean Jordan Lake did its part in the statewide, county by county, NC Big Sweep. The target area was a 2-mile stretch along the Haw R. Arm to the norrh of Stinking Creek. This same section was scheduled for cleaning last March in the Haw River Assembly's Clean-Up-A-Thon. But we were rained out TWICE and finally gave up. A few bursts of heavy rain the evening of Oct. 10th brought back bad memories of March. But Saturday morning brought sunshine and perfect temperature for our cleanup. Volunteers ranged in age from 11 to 79. They were split into four groups to reach the cleanup site by boats and by walking. In just a little over two hours, the shoreline was completely cleared of trash -- 220 bags of trash and 77 tires had been removed. The U.S. Army Corps of Engineers as usual was on hand to provide boat support for ferrying volunteers and trash. Several volunteers brought their own boats to assist. Members of the U.S. Coast Guard Auxiliary of Cary were also there to coordinate on-water activity and help in case of emergencies. About 10 students from environmental science classes at Chapel Hill High participated. They later sent emails to thank Clean Jordan Lake not only for a rewarding community service opportunity but also for the chance to see a SolarBee unit in action. Their class had just been learning about testing to determine if SolarBees can lower the blue-green algae count. They saw first-hand one of the units just off the shoreline. 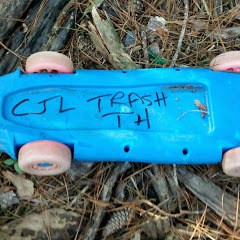 This year's Trash Treasure Hunt was more of a success than we planned. In our pre-event survey to check the cleanup route, we could only find two of the five items we had tagged by GPS coordinates for our cancelled event last March. So we found others to replace them. To not disappoint anyone, we brought extra prizes just in case those lost items were found. It was a good decision because our sharp-eyed volunteers found all of the items! And seven lucky winners got prizes from REI, Great Outdoor Provision Company, Carolina Brewery, Triangle Boat Tours, Subway and PDQ. The lunch of baked penne courtesy of Amante Gourmet Pizza in Cary and Subway 3 ft. sub courtesy of Preston Development Company was enjoyed by all! A reporter from Time-Warner cable news (Channel 14) stayed for the entire event and gave CJL good coverage on the evening news. Accounting for all of events since 2009 both large and small, by various groups and our Adopt-A-Shoreline Program, 3,300 volunteers have removed 9,400 bags of trash (enough to fill 30 large dumpsters) and 3,500 tires. Beyond the impressive statistics, wildlife habitats have been restored, animals are less likely to ingest styrofoam or be entangled in fishing line and the shoreline is far more beautiful to look at!